When we started planning our bike tour, I was really curious how other people get their bikes on planes. It seemed kind of nerve wrecking and complicated, so we read a whole lot about what kinds of experiences other cyclist have had, and that was really helpful. Here's how it worked for us. We arrived early at the Vancouver airport so we could be pretty careful about prepping our bikes for air travel and take our time doing it, but it wasn't too involved. We removed the pedals, lowered our saddles (after marking the seat posts with sharpie to remember the appropriate height), turned the handlebars so they were parallel to the rest of the bike, and secured the front wheels to the frame with some webbing straps to keep them from flopping around. Since rear derailleurs are so delicate, we detached them and wrapped them in styrofoam padding and then secured them to the frame. We also let all the air out of our tires. It seems like that wasn't really necessary for the bikes themselves, but the airlines seem to prefer it, and the fellow at inspection did ask us, "Any CO2?" I assumed he meant the air in our tires, though I suppose it's also possible he was asking if we had CO2 cartridges on us. We did all our prep at the outside entrance of the Vancouver airport after riding from Cowichan Bay to Vancouver (via two ferries). After prepping the bikes and putting tags on them with our names & address, we put them in giant plastic bags, which we sealed with duct tape. (We ordered the bags online from a company called Wiggle in the UK.) 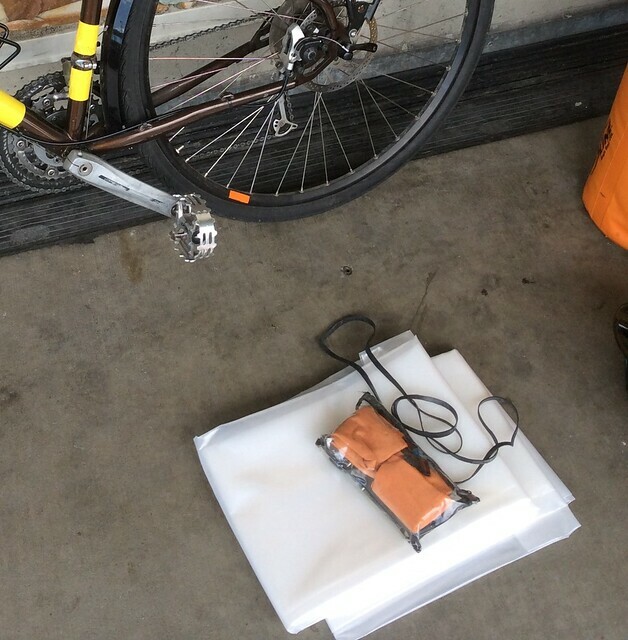 Unfortunately, after we'd taken such care to pack and seal the bags, a security officer inspecting the bikes cut a hole in each of our bags in order to put the explosives-detector wand in there. I know I had the most horrified look on my face as he was cutting because I really didn't want to just damage the bags for no reason. 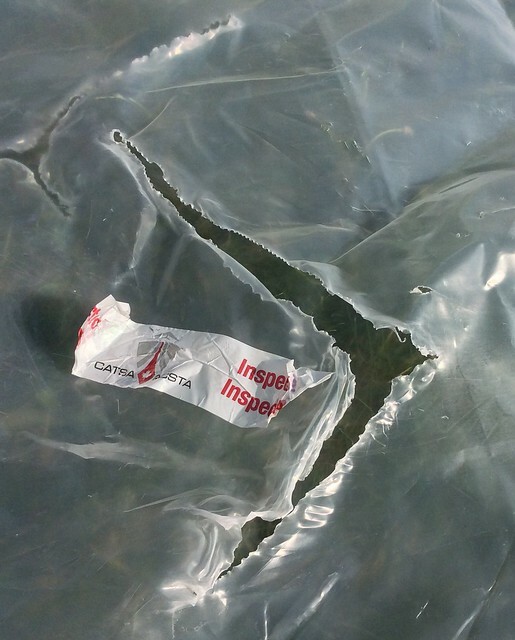 He put a big piece of tape over the hole that said "Inspected". We'll definitely use the bags to get the bikes home, but I don't know what kind of shape they'll be in after that and if we'll be able to use them again. After the security inspection, a guy from the airline came up and hand carried the bikes down to be put on theplane. He seemed to be treating them with care and told us they were in good hands. One quick note - Vancouver airport security confiscated our chain lube, and at every security checkpoint we went through, we got searched extra. The things that seemed to invite scrutiny were our U-locks/cables (we always use both in combination to secure our bikes), our bike pump, and our tools - more about that later. Our nearly 9-hour overnight flight from Vancouver to London went by surprisingly quickly. I actually slept most of the way, so much so that I didn't take out my knitting once, which is really unusual for me. We flew on British Air and I was surprised that they actually gave us some things for free - most importantly, they checked our bikes free. They let you take at least one free checked bag per person and the bikes don't cost anything extra! Beware, though, that they'll probably tell you that you get two free checked bags rather than one; we discovered after we'd bought our tickets that our economy class tickets only came with one even though we were told on the phone that all tickets include two free checked bags. We had to spend an extra $160 to check a box with two of our panniers in it, so it brought the cost of our ticket up, and we had to ride to the airport with a flattened cardboard box on the back of one of our bikes, but it still wasn't too bad.) We also got free wine, dinner, and breakfast on the long flight. I can't remember the last time I got a bag of peanuts for free on a plane, so that was pretty nice. Our time at the London airport, where we had our layover, was probably the most stressful part of our trip. Having been worried that our checked box could get lost, we kept some essential gear, including the tools, in our carryon luggage. I think we'll risk checking the tools next time, though, because we had a slight scare at security when a security officer thought she ought to take away our wrench and bike tool kit, without which, we'd have been stuck stuck at the Amsterdam airport, unable to reattach our pedals, raise our saddles, or turn our handlebars. Happily a supervisor said there was no need to confiscate any of it. Getting through the Amsterdam airport was much easier. Apparently cycle touring is not something that gets extra scrutiny, because we breezed through customs after just a few questions. The security officer also spoke English, which was expected, but still so helpful. It's really nice how much English is present here. 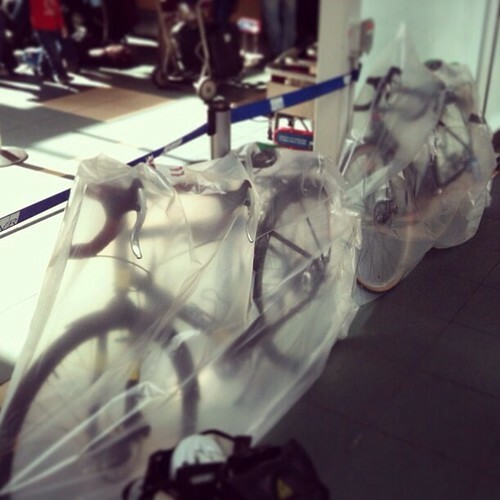 We've never flown with our bikes before, so we were pretty nervous about them being okay after the flight. But just like a baggage handler had hand carried them to the plane, someone hand carried them into the baggage terminal for us! They were never even on a conveyor belt that we saw. (I did see two bikes packed in those big canvas bike bags come rolling down the luggage belt, so I'm not sure how carefully they were treated in comparison with our plastic-bagged bikes.) Our plastic bags had huge gashes in them next to the top tubes where people had obviously cut them to make carrying easier, which was a little distressing, but the bikes themselves were totally undamaged. It took us about an hour to re-assemble and adjust the bikes, as well as re-pack. No one seemed to care that we did all of that in the baggage claim area. 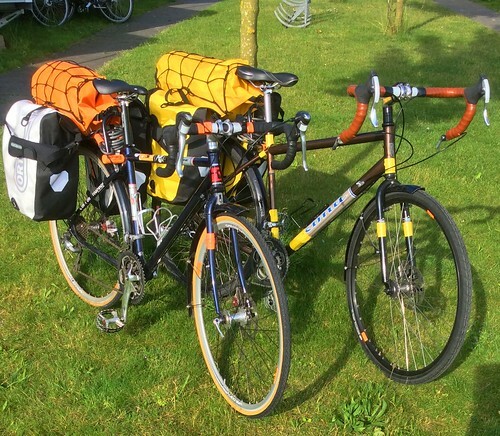 It was intimidating to do for the first time, but overall, traveling with our bikes went really smoothly. Next time, like I said, we'll pack our tools in our checked luggage to avoid any chance of them being taken away. I think I'll also try to pack more heavy stuff in the checked luggage and just have faith that the box will make it. It was pretty uncomfortable carrying a full and very heavy pannier through several airports. I adore my Ortlieb panniers for on-bike use, but off the bike, they're pretty uncomfortable and unwieldy to carry. One thing to mention is that I'm carrying some extra non-cycling stuff that makes everything heavier - a bunch of knitted samples for my Penelope Craft trunk show, some printed patterns (paper is heavy! ), and five knitting projects, which, I obviously need. (They're for work!) The patterns and the samples will be left at Penelope Craft while we're on the road, so I won't be doing the rest of the tour with them, though the knitting projects are, of course, coming along. We haven't done our return journey yet, so I'll have to report back if we have a significantly different experience going the other direction. How have you traveled with bikes? Any recommendations?